Why spend time and money travelling, when you can bring India to your guests? Delightfully Lavish is a boutique events company aspiring to make your wedding exceptional and unique with their stock of beautiful Indian canvas marquees, stretch tents and exotic furnishings. Inspired by Indian culture, and drawing from their experience and knowledge of Rajasthan, they aim to make your event a setting fit for kings of the old Raj. Whether your reception is a sumptuous party for many or an intimate candle-lit dinner for a select few, they aim to give you and your guests an absolutely unforgettable wedding day. Beautiful Rajasthani tents adorned with sumptuous cushions and authentic Indian rugs, Sheesham wood tables and unusual eastern lanterns, create the perfect space to relax. At Delightfully Lavish they have a passion for colour – the tents come in many hues and can be lined with walls of gold-block-printed cotton. 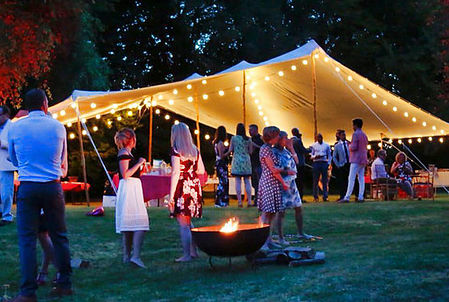 The Maharaja in gold-trimmed hot pink or white is their most popular tent and can seat about 60. Its distinctive Indian arches can be closed off or open. 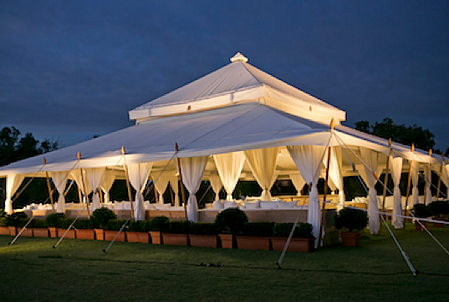 The Mughal Tent is the king-sized one, with its ‘big top’, room for 160 seated diners and space for a dance floor. The smaller options such as their Pavilion and Pergola tents come in many different colours and can be used alone or together; the small pergolas are suitable for very restricted spaces.